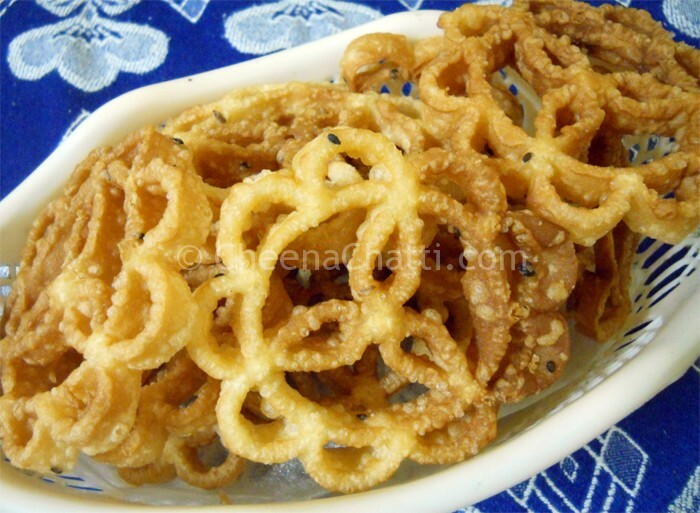 Achappam is a very popular and traditional Kerala / Tamil Nadu snack which is incredibly crunchy & delicious. It is called so because of the iron mold used for its preparation. “Achu” in Malayalam means mold and “Appam” means bread. These two words are combined together to form “Achappam” which means “Bread prepared using mold”. Prepare a semi thick batter in a vessel by slowly adding the coconut milk to rice flour. Beat and add the eggs one at a time to the batter. Add the sesame seeds, cumin seeds to the mix. To this add sugar – a little at a time – mix well in between – and keep it aside for 20-30 minutes. Set oil to heat in a deep bottomed pan / wok / cheenachatti. Immerse an Achappam mold in the hot oil. When it becomes hot, remove the mold from the oil, shake of the excess oil and dip 3/4th of it in the batter solution. Be careful, don’t get the batter cover it completely. Dip the batter coated mold in the hot oil, wait for 20-25 seconds and shake it lightly. When the batter gets cooked it will get detached from the mold and fall into the oil. Flip it in between so that all the sides are cooked until it becomes golden brown and crispy. Drain well on kitchen tissues. Repeat steps 7-11 with the remaining batter. Serve it immediately with a cup of tea. Achappam can be stored in air tight container for months. Remember to keep the container tight to avoid losing the crispiness. This entry was added on September 6th, 2013 by Jameela Beevi in Bakery and tagged with nadan snacks, snacks, kerala snacks, evening snack, nadan palaharam, achappam snack. Last revised on March 28th, 2018.